The Canadian economy saw improvements in 2016, in comparison to 2015, growing at 1.4%, but well behind its 2.6% average growth in 2013-2014. In 2017, economic growth exploded to 3%, only to slow down in 2018 to 2%. During this period, the unemployment rate declined from 7.2% in January of 2016 to 5.6% in December of 2018 – the lowest unemployment rate Canadian workers have seen since the late ‘70s. With the economy performing at full capacity, and the labour market in a state of virtual full employment, the Bank of Canada has increased the overnight interest rate five times since January 2016, hoping to maintain inflation expectations within the target range of 1-to-3%. While the Bank of Canada has cited the increased debt load that Canadians are carrying as well as snail’s-paced wage growth as causes for concern, it has continued to hike up interest rates so it has room to manoeuvre and ‘hike down’ when the next economic downturn emerges. Although the necessity of continuing to hike interest rates is questionable, given the concerns cited by the Bank of Canada and mild inflation, one thing is certain: increasing interest rates risk slowing down economic growth, and with it, eliminating the existence of tight labour markets, conditions in which workers’ bargaining power is generally in a more favourable position. In standard economics approaches, a tightening labour market and a subsequent scarcity of jobs generally translates into workers’ wages being bid up by employers. As employers race to find workers from a shrinking supply, they try to outbid other employers as a means to secure workers’ services. In other words, tightening labour markets are generally conducive to workers’ bargaining power, as workers have plenty of options to sell their capacity to work. For workers, tight labour markets mean it’s a sellers’ market. Figure I, above, broadly captures this trend. From January 2016 to December 2018, the unemployment rate declined 7.2% to 5.6%. During this time, non-management workers’ nominal wages―the money price of their wages―increased by 5.6%. Most of the wage growth that workers experienced occurred in late 2017 to early 2018. It would appear that workers largely benefited and saw their living standards increase in the previous three years. During the same period, however, workers’ real wages – wages adjusted for inflation, i.e., purchasing power – have stagnated. 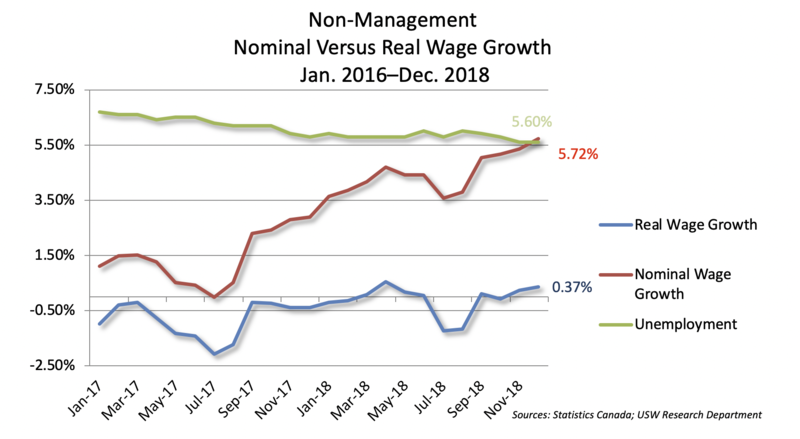 [See Figure II, below] While, since January 2016, nominal wages for non-management workers (80% of the population) have grown 5.6%, real wages have grown by less than 0.5% (0.37%). Real wage growth for workers in traditional industries was particularly bad; blue collar workers saw their wages decline by half a percent, while workers in manufacturing saw their real wages decline by 1.26%. It is obvious that if workers’ living standards are to increase, their purchasing power must also increase. In other words, their money wages have to rise faster than inflation. If enough workers can organize strong unions, they can force employers to share some of their profits without driving up inflation too much. 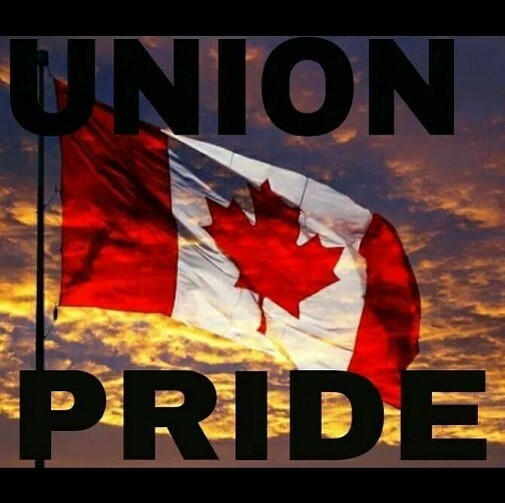 Faced with strong unions pushing for higher wages on the one hand, and competitors keen to take away market share by keeping lower prices on the other, employers will not pass on the full cost (or any) of increases to prices, and instead (made to, through organized bargaining power!) “share” their profits with workers. In this way, unions not only help in increasing real wages for workers but can control product markups and redistribute income away from profits to wages. The most recent business cycle and the weak relationship between tightening labour markets and (real) wage growth should lay to rest the belief and faith that the interactions between supply and demand are sufficient to increase workers’ living standards. This faith is misplaced because there is nothing “natural” about the market. What we call the market, particularly the relationship between workers and management, is not just a simple “exchange” relationship, like buying an apple from a store. It is a relationship infused by power and characterized by conflict. Employers want to pay the least possible; for workers, this means poorer living standards. Workers, on the other hand, want to earn as much as possible; this means (potentially) less profit for owners. In a situation such as this, characterized by opposing interests, conflict is the name of the game, and force decides. While tight labour markets are fundamental and beneficial to workers’ bargaining power, they are simply insufficient in their ability to provide workers with increasing real wages. Only organized bargaining power – in the form of unions – can do this. This entry was posted in Uncategorized on February 2, 2019 by greybrucelabour.